With observations from the fields of cultural anthropology, philosophy, and, yes, psychological science, he got them. In this symposium, four scholars analyzed diversity in science and explored the ways in which the nature of science may depend on who is doing it. Douglas L. Medin begins with a story about a trip to a Smithsonian museum. “That experience led me to think about who owns and operates no just science museums, but science itself,” he says. Douglas L. Medin begins with a story about a trip to a Smithsonian museum. “That experience led me to think about who owns and operates no just science museums, but science itself,” he says. Stanford University professor of philosophy Helen E. Longino acknowledged that her greatest interest was the impact of diversity on the quality of knowledge. Put simply, free and open inquiry that expands the limits of knowledge can only occur when old culturally and socially prescribed assumptions are jettisoned. Fresh perspectives from new participants asking unexpected, provocative questions must find their way into scientific inquiry. Helen E. Longino discusses the philosophical underpinnings of knowledge and its constraints. By actually engaging the critics, views that might have been discarded are no longer marginalized, inquiry broadens, and an important, unexpected, and diverse perspective asserts itself. “The viewpoint of diversity of the cultural or moral sort is what I will be getting into today,” said University of Chicago cultural anthropologist Richard A. Shweder. “Imagination, creative intelligence, and disciplined inquiry are not bound by status. You don’t have to be a male to understand men.” In a talk that ranged from the 16th century French philosopher Michel de Montaigne to the temple town of Bhubaneswar in India, Shweder explored the intricacies of moral relativism, ethnocentrism, and the limitations of perception. Status does not restrict imagination, creative intelligence, and inquiry, says Richard A. Shweder. If Longino and Shweder posed new theoretical challenges, psychological scientists Margaret Beale Spencer and Megan Bang showed how diversity expands inquiry in real research. Margaret Beale Spencer, University of Chicago, challenged “stagnant science” when she explained how systems theory and mixed-method approaches led to much more nuanced and grounded portrayals of human development for diverse communities. Margaret Beale Spencer believes diversity in researchers and research methodologies can truly reflect diverse communities. they showed the children the same cards, but the children in the experimental group were also exposed to a mechanized puppet that cheered and dispensed a reward when they selected the Black images over the White images. In this phase, the subjects in the experimental group selected the White images only 40 to 54 percent of the time. As this process was repeated, the children in the experimental group chose the White images less frequently. She said that they “trained the children that all things bad were White and all things good were Black, using incentives to reinforce the new learning.” Children responded with ease to the concept — but when presenting the findings to some of her fellow graduate students and colleagues, their own discomfort with the concept further underscored the depth of the framing assumptions. 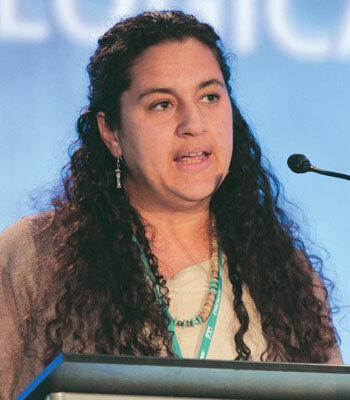 Megan Bang, an assistant professor of educational psychology at the University of Washington College of Education, demonstrated the importance of working with different populations with examples of her work with Native American communities. Megan Bang describes her research on culturally relevant instruction in science learning in young children. How do perceptions of nature and culture compare in Native American communities and European communities? How do those perceptions change when those groups live in urban and rural settings? “We sought to explore how the organization of knowledge impacts reasoning in these communities,” she said. Consider the conversation of a child with an adult while playing with toy animals. For a European child, a discussion about an eagle seeking food led to a discussion of the food chain: The eagle eats a fish, a fish eats a worm. The conversation between a Native American child and a parent about the same eagle seeking food proceeds in an entirely different direction. The eagle eats a fish, but what other animals eat fish? Turtles, for example, and bears. The conversation is a window into a whole world. In addition to “culturally relevant instructional paradigms that can be used in science education,” as Bang said, there are also implications for the entire nature of scientific inquiry. And in the end, so does science.